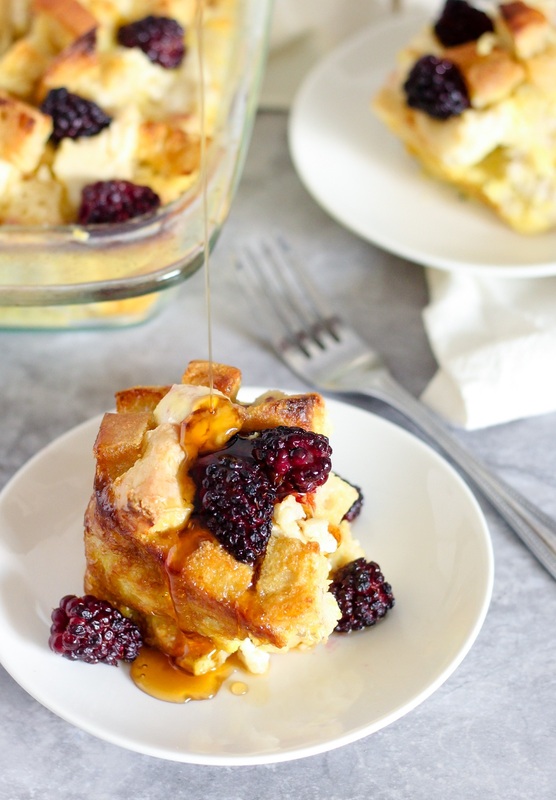 Stuffed with dairy-free cream cheese and fresh blackberries, this delicious gluten-free French toast casserole recipe is literally loaded with flavor and perfect for feeding a hungry family with ease! Grease a 9” square baking dish with Miyoko’s Vegan Butter. Add cubed bread. In a medium bowl, whisk together eggs, almond milk, and maple syrup, then pour over cubed bread. Evenly distribute cream cheese dollops throughout casserole, as well as blackberries. Pour melted vegan butter over the casserole, then let sit covered in the refrigerator for 1 hour. Bake at 375°F for 40-45 minutes, or until the the egg mixture has set and the bread becomes golden in color. Remove from oven, serve with maple syrup, and enjoy!